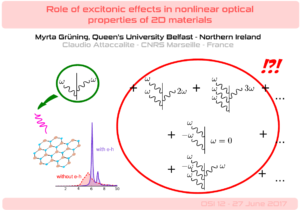 My collaborator Myrta Grüning gave a very interesting talk about the role of excitons in non-linear optical properties of 2D materials at the OSI 2017 conference. She discusses both second and third harmonic generation in low dimensional nanostructures. Slides of her talk are available here .